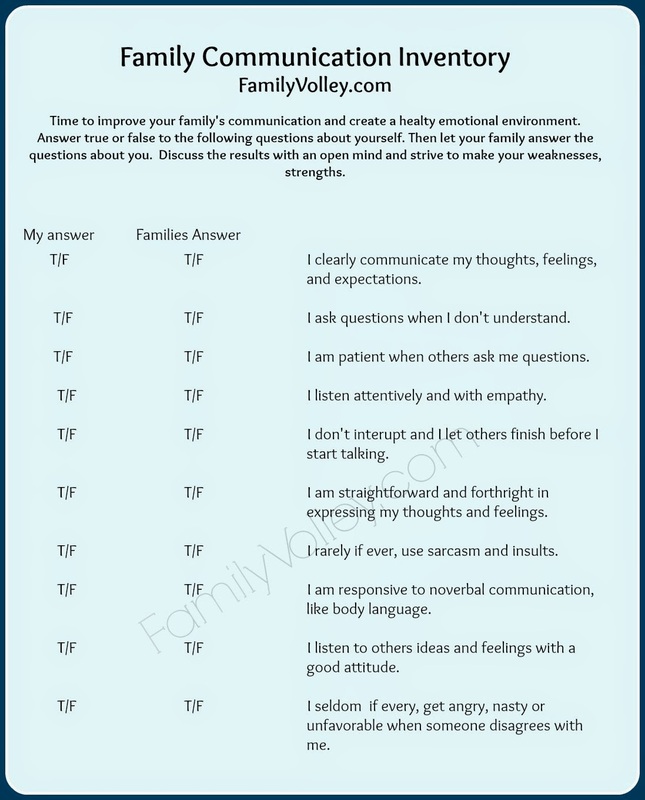 Family Volley: Improving Family Communication-Does Your Family Like the Way You Communicate? Take a Test. Improving Family Communication-Does Your Family Like the Way You Communicate? Take a Test. When it comes to learning to communicate, family is the school room. The way we communicate with our children and our spouses, teaches our children how to communicate. If we sulk and pout, raise our voices, ignore and hold grudges, we are teaching our children that that is the way to do things. Which sets them up for trouble as they get older. They will take those same bad habits into their future relationships. But...if we work to model healthy communication, listen more than we talk, rarely use sarcasm and insults, say what we mean, practice empathy, and ask questions when we have them, we send our children out with valuable tools to use in every area of their lives. The funny thing is, how we see ourselves communicating, is not always the same way our family sees things. Time to take a step back, be honest with ourselves and with one another, and take a little communication inventory, to see how well things are going in our homes. Take a few minutes to answer the following questions. Then, cover up your answers and have your family answer the same questions about you. (You can print the inventory right from this post.) Obviously you want to answer true to all of them, and you want your family to do the same. But chances are, that won't happen. Be open to the constructive criticism and evaluate what each person in the family can do better. You will love what an activity like this can do for your family. Let me know how it goes! Oh man, last week my oldest son was baby-sitting while I ran to the store and my middle son called to tell me it wasn't going well. In the background I could hear the oldest just SCREAMING at my little girl, like, out of control screaming. I told him to hand the phone to his brother and then as I rushed home I told him he needed to go into his room and calm down. I got home about 4 minutes later and as we talked it out I realized he was emulating me when I was frustrated...YEARS ago. I made a commitment not to yell years ago and haven't done it for several years, but I was so sad and embarrassed that he still remembered me that way and thought of it as a good way to get my daughter to cooperate (she wouldn't put on underwear. THAT'S what initiated the scream match of the century). I was so mad at myself. I've been working for so long on being a better communicator and this is what he remembers! Ugh. I love to visit this website which helping me to improve healthy communication with family, children, and teachers because I am working women as well as it give me a guidance on how to support students with valuable tools to use in every area of their lives who are come to seek finance dissertation help - http://www.dissertationhelp.uk/finance-dissertation/ from me as I am a dissertation tutor at Dissertation Help UK where we will also offer free revisions as per finance tutor feedback. Special thanks for beautiful blog content. I have read many posts from here. I feel all posts are informative. All posts includes the information regarding the family and parenting and so on. So It will be beneficiary for most women. Communication in the family is an important part of the relationship. I think this test needs to be passed by the whole family to understand what the problem is and discuss it.